Doenitz had served aboard U-boats during World War I. He was a keen proponent of undersea warfare. In 1935 he was made commander of Germany’s small submarine force and oversaw its gradual but not insignificant expansion leading up to the outbreak of World War II. Doenitz’s career took off when Hitler lost faith in his country’s surface fleet after a series of losses, the most famous being the Bismarck in 1941. 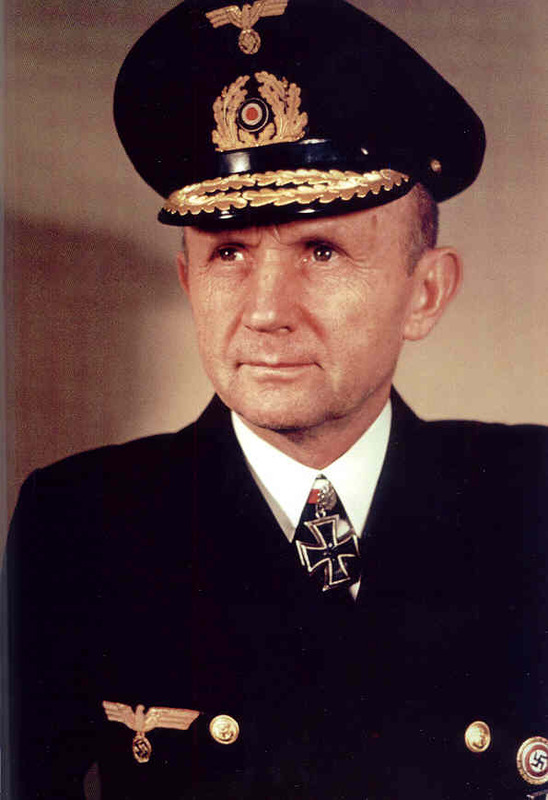 In 1942 Doenitz was made a full admiral and replaced Grand Admiral Erich Raeder as Oberkommando der Marine in January 1943 when the surface fleet was all but moribund. Doenitz tried to regain the initiative in the Atlantic with innovations in U‑boat construction, superior anti-aircraft firepower, and new propulsion systems. But these changes, which made the German submarine fleet the most advanced in the world, had no major effect on the outcome—the battle for the high seas had been largely lost. By the end of May 1943 the Allies had sent one hundred U‑boats in five months to their watery graves, leaving Doenitz no option but to withdraw his precious crews and fleet from the North Atlantic to Nazi-occupied Norway and the Baltic. A tally at the end of the war was evidence of the awful death count: Of the 630 U‑boats lost at sea, 603 were destroyed by enemy action; 215 were sunk or blown up by their crews on evacuation of overseas bases or at the end of the war; and 153 surrendered. On April 30, 1945, the day Hitler committed suicide, Doenitz assumed the helm of the crumbling Third Reich. The new Reichspraesident (President) and Supreme Commander of the Armed Forces sent emissaries to Gen. Dwight D. Eisenhower’s headquarters in Reims, France, where they signed the German Instrument of Surrender on May 7. Doenitz was tried by the Allies at the Nuremberg Trials, along with other major Nazi figures—including Air Marshal Hermann Goering, Foreign Minister Joachim von Ribbentrop, and former Grand Admiral Erich Raeder. Doenitz was convicted of war crimes and sentenced to serve ten years. He was released in 1956. For nearly 70 years Doenitz was the only head of state to have been convicted by an international tribunal until Liberia’s Charles Taylor in April 2012.